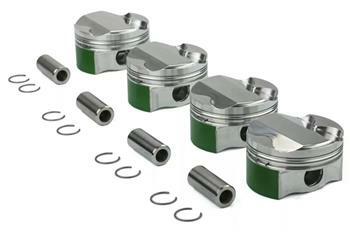 The piston is one of the most important components within the engine. It can be subjected to directional change up to 285 times every second and must withstand acceleration forces of 8500g’s. Cosworth high performance forged pistons are designed and engineered to withstand this type of punishment and still perform. All Cosworth pistons are manufactured using the same methods as our Formula One pistons and include features such anti scuff skirt coating, ultra-strong pins, polished top and patented antidetonation bands. Additionally, each application uses a unique forging to minimize weight and ensure the strongest possible piston design.